This September, Capcom is releasing the Mega Man Dual Pack, a PSP title that includes both Mega Man: Powered Up and Mega Man: Maverick Hunter X. Initially a GameStop-spawned rumor, the existence of the Dual Pack was recently confirmed by Capcom Senior VP Chris Svensson on the company's site. The game will hit shelves on September 5 and sports a $15 price tag. 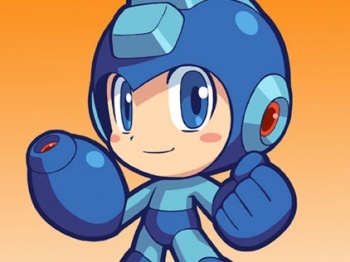 The two games included in the Dual Pack, Mega Man: Powered Up and Mega Man: Maverick Hunter X, are massively enhanced remakes of the original Mega Man and Mega Man X, respectively. Now normally we wouldn't go to the trouble of highlighting every reissue that Capcom brings to market, but in this case we feel a strong moral obligation to highlight the Dual Pack. First, because the title is so cheap, and second, because this gives you PSP owners a second chance to support Mega Man: Powered Up. The game may have been a modest success when it was originally released in 2006, but given the care and clever design nuances that Capcom pumped into it, Powered Up deserves far more. Five years ago, on a handheld no less, Capcom was giving players the opportunity to create and share levels over the Internet! For free! That's not even getting into the actual gameplay. The original Mega Man is a brilliant, frustratingly hard example of NES-era platforming, and Powered Up both retains this taxing design (in the game's original mode) and improves on it (in the game's remixed levels). Likewise, the graphics and sound have been given upgrades (again, entirely optional) that take elements of the game's original aesthetics and aural design and merge them with modern Capcom sensibilities and now-generation gaming tech. Add to that roughly a thousand unlockable extras and you have a game that really deserves more of your love (and all important consumer money). When the Mega Man Dual Pack arrives in a few weeks, I hope you'll remember what I've said here. You PSP owners have already let Capcom down once. You don't want to do it again, do you?